The Bajaj Avenger when launched, was billed as the poor man's Harley-Davidson. Its low slung cruiser stance, decent 180cc engine and Bajaj's killer pricing made it a sweet deal back then. 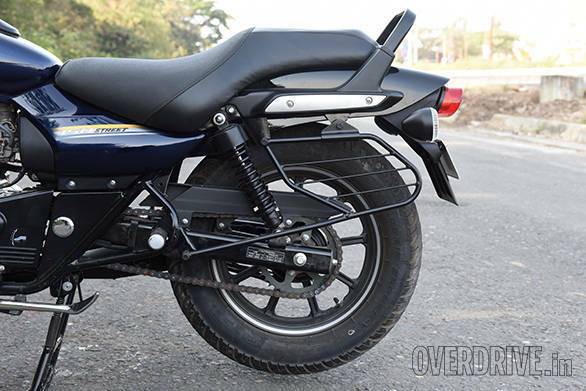 Bajaj kept upgrading the powertrains, that were lifted off the Pulsars, but sales of the Avengers hit a ceiling and it was about time that Bajaj looked at upgrading the Avenger. What Bajaj has done instead is diversified the Avenger line up into the Cruise and Street, and the base Avenger Street 150 that you see here is aimed squarely at those who want a cruiser without busting the bank. The Bajaj 150cc Avenger is only available in the Street trim and at first glance it bears a striking resemblance to the Harley-Davidson Street 750. While the body panels are similar to the Avenger Street 220 and Cruise, the Bajaj Avenger Street 150 gets gloss paint all over with decals on the tank and a stripe that runs from the front fender to the tail section. The housing for the tell tale lights that sits on the tank is finished in matte black. The other bits that get the black treatment include the suspension units, instrument pod, mirrors and rear grab rail. The blacked out handlebar is nearly flat and lower than that on the Avenger Cruise 220. What's annoying though, is the location of the tell tale lights. With your head up while riding, only the instrument pod lies in your field of vision which means you have to look down to confirm if you have activated or cancelled the indicators and that means taking your eyes off the road for that split second. The seat's foam thickness has been increased which in turn has increased seat height by 15mm to 725mm. The seat felt comfy and my large derriere was easily accommodated. But there's a glaring design flaw with the Bajaj Avenger Street 150 and that's with the handlebar, footpeg and seat positioning. Bajaj, in their attempt at making the motorcycle suitable for urban environs, have pushed the handlebar a tad too far away from the rider. If you sit within the contours of the seat and place your legs on the foot rest, you'd have to stretch a bit to reach the handlebar, and to put things in perspective, my height is 5'11". Also, the Avengers Street and Cruise have the same rake and trail and similar footpeg position which adds to the discomfort. Continuing to ride in such a position puts strain on your lower back and shoulders, which result in aches after a while. The best compromise is to sit slightly closer to the tank but that makes your spine upright and again the discomfort kicks in. Ideally, the handlebar should have been placed slightly closer to the rider to offer better riding ergonomics. 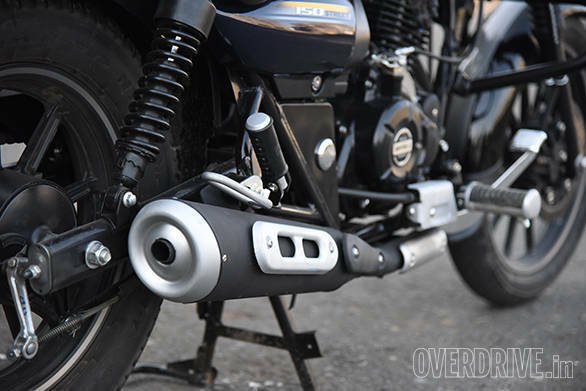 Other bits that I did not like were the silver matte finished heat shields on the exhaust pipe. They are poorly finished and in fact the same bits in chrome on the Bajaj Avenger Cruise 220 look far better and will certainly last longer. 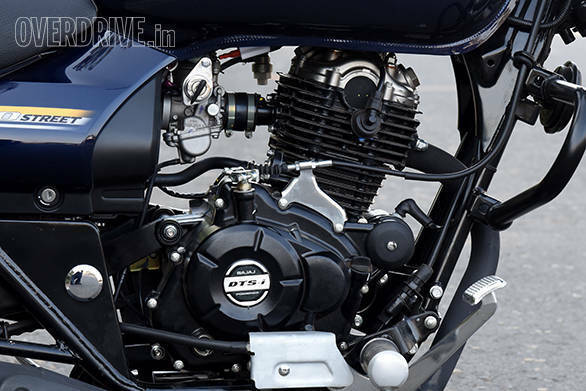 The engine is the gem here and Bajaj have done a fabulous job of re-configuring the Pulsar 150's engine for the Avenger Street 150. It is smooth and refined across the rev range and the vibrations in the footpegs are far lesser than the Avenger Cruise 220 . It develops 14.5PS@9,000rpm and 12.5Nm@6,500rpm. It gets the larger air filter from the Bajaj Pulsar 220 which results in a 10 per cent hike in torque over the Pulsar 150. The low and mid-range is the engine's strong point and considering the urban riding focus of this Avenger, the power delivery is just as required. Slicing through traffic is a breeze and I had to rarely downshift to pull quick overtakes. Out on the highway, the engine is not buzzy at high speeds and cruising at 80-90kmph is possible without complaint. 0-60kmph was dispatched in 9.4 seconds and we recorded a top speed of 102kmph. When we rode it solo, the power felt sufficient but we feel the engine may feel a bit out of breath in case you load some luggage and carry a pillion up a ghat section. In the city, the Avenger managed 61.4kmpl and that figure climbed to 68.25kmpl on the highway. 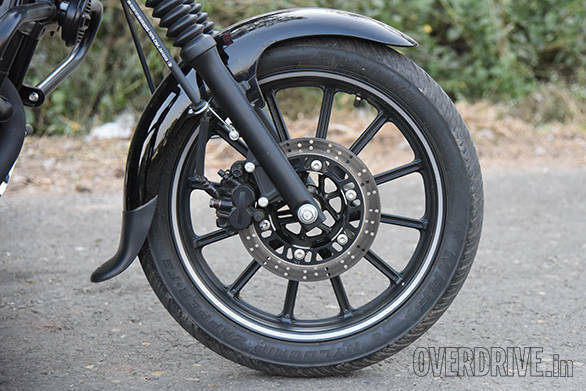 The previous Avenger was prone to bottoming out over bumpy roads, especially with a pillion and Bajaj have changed the second spring rate in the rear suspension in the new Avenger to address this issue as well as to increase the load bearing capacity of the motorcycle. Ride quality over bad roads is impressive and the suspension did not bottom out over the harshest of bumps. 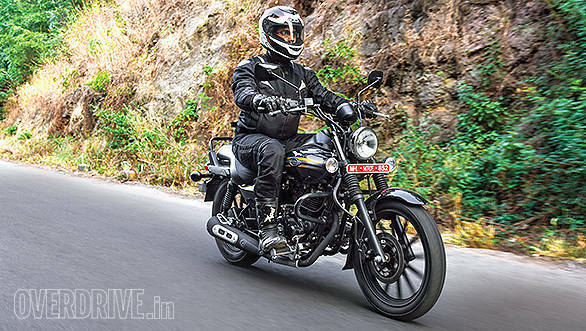 Now, the Avenger is not a corner carver but it's surefooted around a bend with the MRFs on 17-inch front and 15-inch rear alloy wheels offering decent grip. The brakes are sharp with good progression and offer good feedback The Avenger 150 Street gets 240mm discs at the front and the unit is in fact, better than the one on the Avenger Street 220/Cruise (see table below). 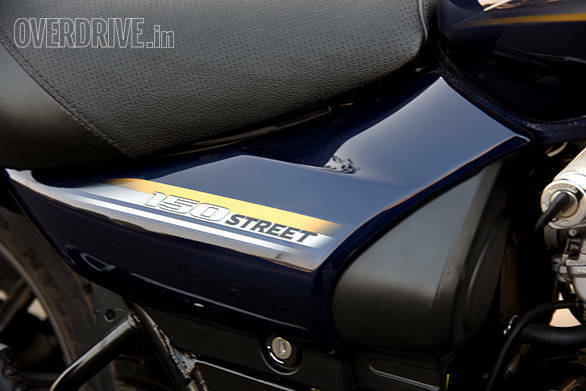 The Bajaj Avenger Street 150 has a lot going for it. Its styling resembles the bigger cruisers in the market. The engine is its hallmark and the smooth nature is what adds to the calm riding experience that cruisers ought to deliver. The dark stealth theme of the Avenger Street 150 is in line with modern times and the interests of the target age group (25-35 years). 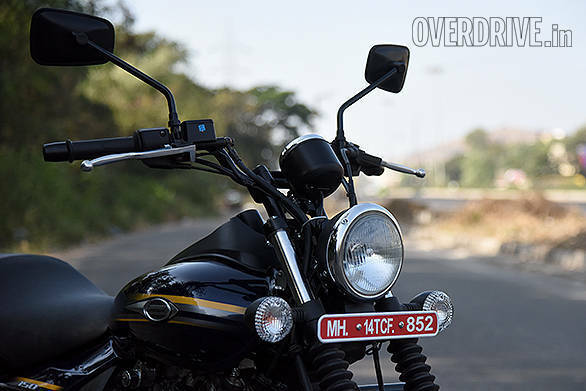 The riding position is a bit of an issue and we feel that swapping the handlebar with the one on the Avenger 220 Cruise can cure the problem. The immediacy of steering and flickability in the city may reduce and it certainly won't be cumbersome to ride. At Rs 87,194 on-road Mumbai, the prospect of a cruiser at the price of a regular 150cc motorcycle makes the Avenger 150 Street an interesting proposition.